I think a lot of people have had to cut back on salon visits and treatments and are turning to home ones to get them by. I always loved the gloss that my hair dresser put on my locks – the smells of the formula and obviously the look. 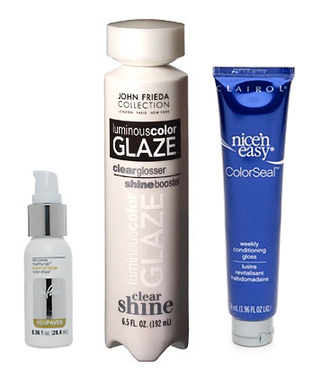 So I was searching the drugstore shelves recently for something to give my tresses a kick and came across JOHN FRIEDA’s Luminous Color Glaze ($9.99/6.5oz @ amazon.com). We loved their clear Color Glaze so it only made sense to add some color to the formula, or to market it all over again (haha). So if you need to cover your greys or are just looking for a boost, this does it and in 3 minutes! Available in 3 colors. We love seeing a trend come down the pike, especially one that is newish. This one? Hair glossing and the yeahs and nahs seem to be mixed from what I’ve read on other blogs with course hair types seeming to have the best results. However, mine is not course and I had pretty great results overall. So I guess in this case, you should probably try it to see if it will work for you. KEN PAVES Boost Up Color Drops ($39.95/.96oz @ hsn.com) is more of a color boost and this one enhances the sheen and adds gloss. Add a few drops to your conditioner and this one can take a few uses to give you that boost. Choose from 5 different shade enhancers, from Brown to Blonde and Red. JOHN FRIEDA Clear Shine Luminous Color Glaze ($9.99/6.5oz @ amazon.com) – this one smells just like the one my hairdresser used to use on my hair but this one costs a lot less. Apply to totally dry hair for 20 minutes and rinse. CLAIROL Nice’n Easy Colorseal Weekly Conditioning Gloss ($4.59/1.96oz @ drugstores nationwide) – weekly treatment for those that color our hair. Use this one in placement of your regular conditioner.